There are two types of valve mounting plates available from API Pneumatic UK: mounting plates for valves with NAMUR interface and plates for series A1 valves, specifically for use with ISO 15552 cylinders. API mounting plates for valves with a NAMUR interface are used between the valve body and actuator where the coils are thicker than the valve body. Choose from two different versions: NAMUR 3/2 or 5/2 valves. 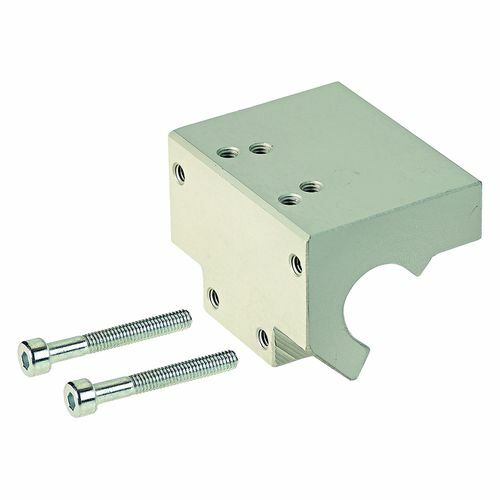 The valve mounting plate for series A1 valves supports the connection of A1 valves to the tie rods of the cylinder. There are 4 versions available, specific to the cylinder type. Providing space saving cylinder control, our valve mounting plates feature multiple mounting holes for at least two sizes of A1 valves, depending on the cylinder’s bore size. For more information about our API mounting plates and accessories, contact API Pneumatic UK today. Call 01782 206 995 or email sales@apiuk.co.uk to speak to a member of our team.